How do you rebalance and return to equilibrium after the shock of devastating events? You may be wondering, can I ever find peace again? Or trust? Or safety? Initially you may feel in shock, numb and unable to function. You may have strong reactions — fear, anger, thoughts of revenge and recrimination, outrage and so on. It’s a good idea to reduce media watching if your nervous system has become over-activated. The essential facts will be there for days, even weeks, when you are ready and in a less raw state. Try Rescue Remedy (flower essence) for shock. It’s available at most pharmacies. Lie down and slow your breathing. How can you ever include these events in your world view, which may have been shattered? This will take time. At first the frightening aspects may balloon out, as if an airbag has been activated inside you, that takes up so much space that it diminishes your usual sense of self. As you find some calm and safety, bring your focus back to what is good and stable in your life. Bring in positive symbols of strength, beauty — perhaps in the form of flowers — cook comforting food, and be with loved ones. Let these qualities flow into you like water, clearing the agitation and fear. Having attended to yourself, you will now be ready to take in more facts, maybe to read some sound and thoughtful commentary that will help you to adjust your world view and to understand what you need to integrate into it. Once you are grounded, you may wish to be of service. There are many ways to give. For some it will be through actions such as making donations, offering food, or working for political change and raising awareness of key issues. Some of you will be very good at giving emotional support to those who need it, through your presence, care, and your ability to listen. For others, your way may be to restore balance on soul level by being part of creating an outbreak of love and care. 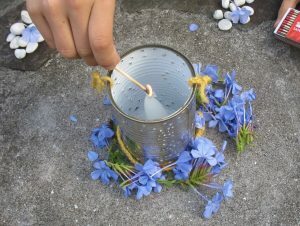 You may find rituals helpful, such as creating memorials or shrines in nature. 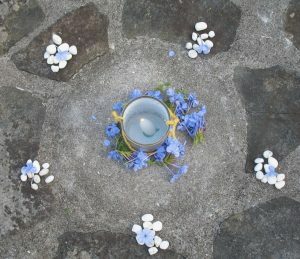 The images included here are from a ritual I did at the beach and another created with my family over the weekend. You may immerse yourself in prayer for all those who have been affected. Ritual and prayer are not a substitute for other kinds of action. However, ritual and prayer make clear action possible, from a strong and whole heart that is capable of clear seeing. Remember that Nature knows how to rebalance after extreme events. When you’ve spent time in nature you may have observed how life returns to a severed branch, to the flattened ground in a forest where a tree has crashed, to a steep bank where a landslide occurred and even to a poisoned waterway. Nature sets to work immediately, as micro-organisms, insects, small animals, plants, and seeds carried by birds or the wind begin their work of restoring and regrowing. 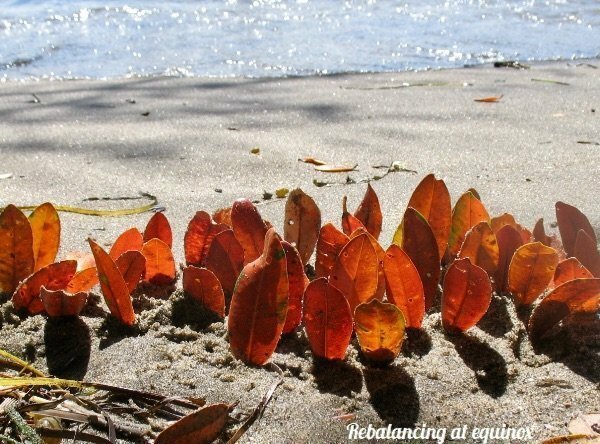 I send you blessings this Equinox, as light and dark, day and night fall into balance. For further reading go to Chapter 12 of my book A Cup of Sunlight, This chapter was written after two other devastating world events. You may be surprised at the wisdom that was expressed by spiritual communities at that time. beautiful Juliet, and wise, and yet… can’t help but think of nature- while it heals.. at the same time there is the terrible beyond. belief natural tragedy in Mozambique, millions displaced hungry homeless…sad sad.. Indeed humans have contributed to much of the damage, by land clearing- mudslides- but still, an act of dear beloved nature…which will heal…. Thank you Minnie. I’ve been reading part of Renee Dubois on how nature healed after the Krakatoa eruption which wiped out all of life. The process was amazing. Thanks, Juliet- a creative and healing response to our shared upheaval. Chris, thank you for this response from Christchurch where you are so close to it all. What a touching moment, that meeting of the eyes of a Muslim woman. That connection across differences is so beautiful. Ann, it must be especially difficult for those of you who live in Christchurch. I’m glad the rituals have been helpful. Be good to yourself. you’ll see some beautiful memorials and shrine that people have created. Thank you HIlary, we are receiving so much loving support from overseas. Thank you Juliet for your kind words of wisdom. I will be sharing this lovely page with my students. Many blessings to you during our spring time and your autumn in your part of the world. People in search of peace, blown apart. Our pride in what we believed our country to be, gone. Let those guns destroy our ignorance, destroy the delusions that we are not part of this… that this is not our country. There is darkness and light everywhere, including inside each one of our hearts. We are in this together- each one of us with our role to play in making things better. Hatred eases our pain only temporarily but humility is a patient teacher and listening brings more understanding than talk. When we allow our pain we are given more access to our compassion. These are dark days but we are kind people in a beautiful country with tangata whenua guardians and a leader with a heart filled with love. We can show the world how to respond to an age old problem. There are only two options, love and fear. I know Aotearoa and I know which one we choose. Kia kaha my beautiful country. I love you my Muslim brothers and sisters and I am so deeply sorry for your senseless loss. With God’s grace and our human kindness I pray your sacrifice will not be in vain. Thank you Emma for your heart-centred words. Thanks you dear Juliet for this lovely page….response to the devastating events in Christchurch. I felt more peaceful simply reading what you have written. How united we all are at this very very sad time. May this sense of connection and ONENESS continue for all of us for as long as we all have on this beautiful, but troubled planet. Cecily, thank you so much for your response, and for your beautiful prayer at the end of it. I’m so glad that my newsletter brought you some peace. I wrote out all the people’s names, those who passed away, and found out who they were, what they did or planned to do, where they hailed from – to remember them and their individual contributions to our country and communities. What a terrible loss! I will remember them and be even more determined to promote understanding, care, kindness and mutual respect and tolerance in my life and work. Paul, I find this so moving. You have personalised every one of the 50. What a sacred piece of work; thank you so much.